One may ask the question, What is Mexican Sushi? 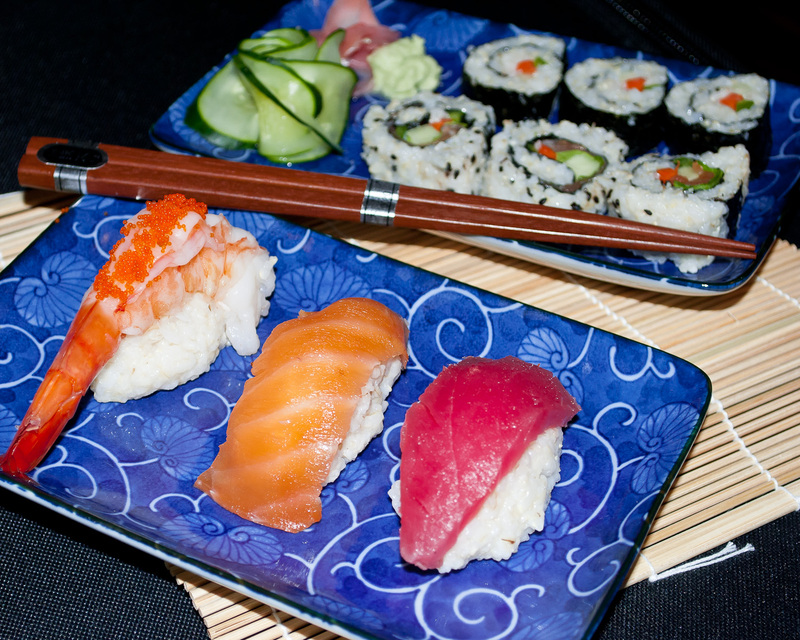 Well, it is not much different from the classic Japanese sushi that we all know and love. It just simply utilizes some Mexican flavors to kick up the volume. 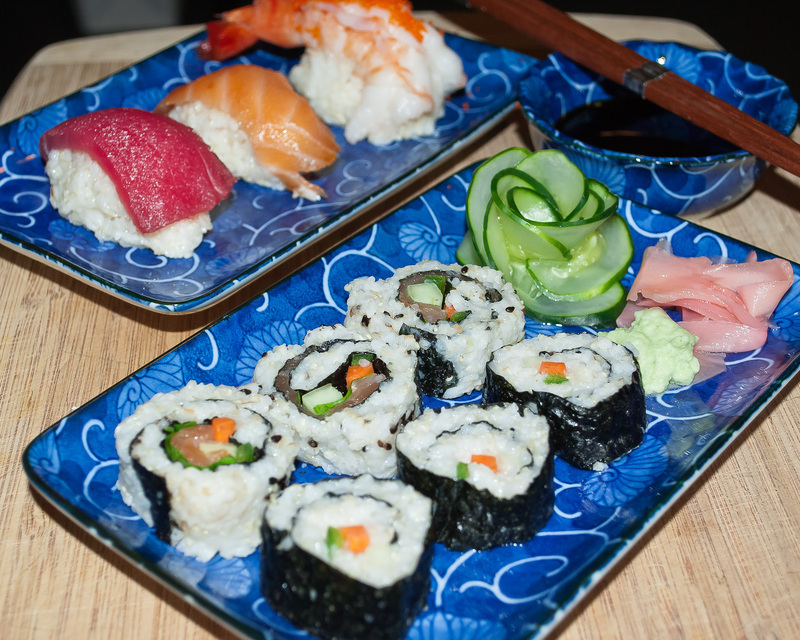 We replace the wasabi placed under the nigiri (a slice of raw fish on a thumb sized chunk of rice) with chipotle, add in a little jalapeno in our futomaki ( or “fat” roll) , some ripe avocado, toss in a little cilantro and we have our Mexican Sushi! One of the challenges of making this dish was trying to get the Integrale rice to play the role of the classic Japanese sushi rice. I found that you need to tweek two parts in the process. I found that you needed to soak the rice for a extended period of time before cooking. I also needed to decrease the amount of water used in the preparation of the rice or else the rice becomes too much like dough. 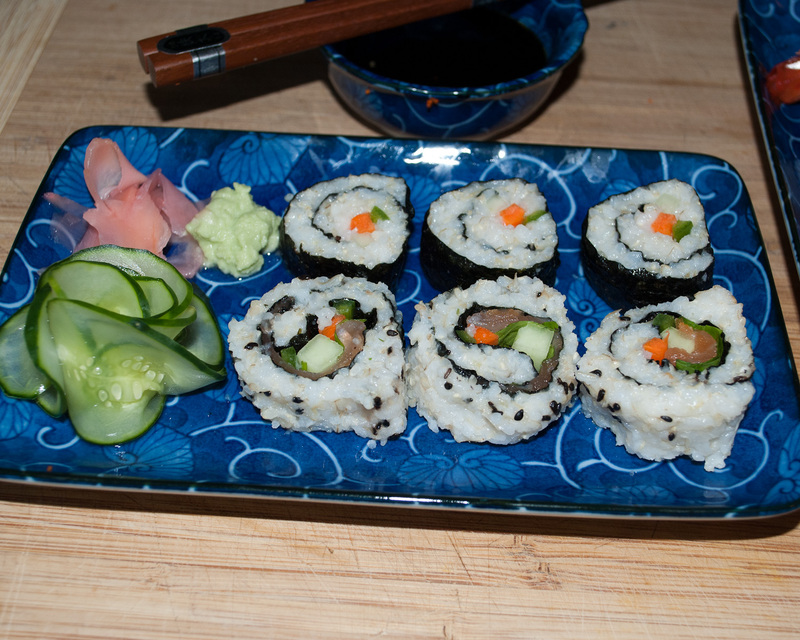 Once I had cooked and seasoned my rice, I wanted to make two different types of rolls for my entry. I wanted to make the classic Futomaki, a seaweed encased sushi roll filled with cucumber, carrot, jalepeño, and a hint of my chipotle mayo. I call this the “Chilango” roll, a complete vegan roll inspired by the chic urban youth of Mexico City. Next on my list was the “Mexicali’ roll. This is a Uramaki, or an inside-out roll. This type of roll is a bit more challenging because you have to flip the nori (the seaweed) over once the rice is spread out. For this roll I wanted to meld the flavors of smoked salmon, green onion, cream cheese, cilantro, and finally some avocado. 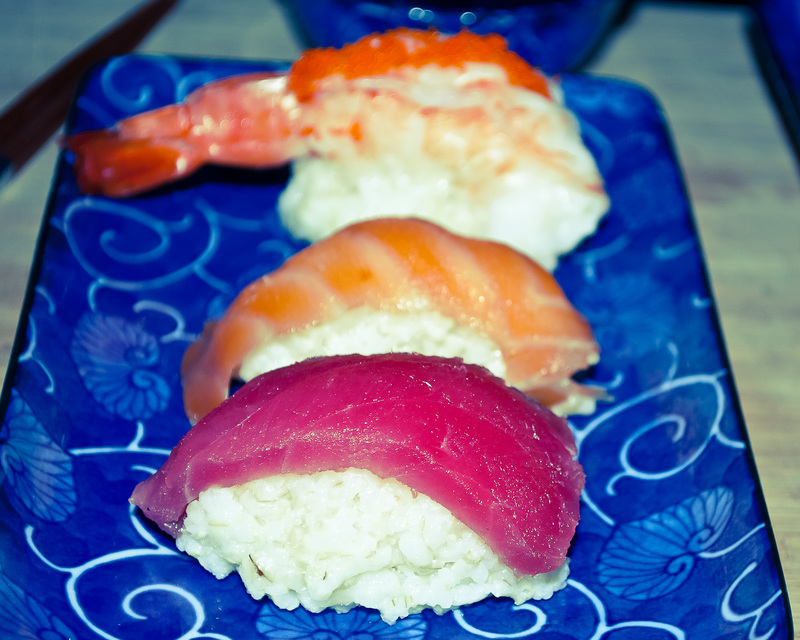 Now there was one more roll I wanted to make, but my rice supply was dwindling, so I set to making the Nigiri. This is a fairly simple preparation that involves making a thumb-sized oblong portion of rice and slapping a piece of raw fish on top. I wanted to kick it up a bit and I slathered my chipotle mayo over the bottom side of the fish and then placed it on the rice. I had a beautiful portion of sushi-grade Ahi tuna, some smoked salmon (smoked locally in Maine of course!) , and some fresh jumbo shrimp. So here we are, two plates of delicious Italian-Mexican-Japanese inspired sushi! Grab an Asahi or some Saki and Kanpai!!! Place the rice in a large glass bowl and rinse the rice with cold water for 10 minutes or until the water become clear and no longer cloudy. You are rinsing all the starch from rice. Dump the rice into a fine mesh sieve and allow to drain for at least 30 minutes. Place into a rice cooker and add the 2 cups of water. Set cooker to Cook and let it go! Once the switch resets to warm, allow the rice to steam for about 15 minutes. Remove the rice, using a wooden spoon, to a non-reactive bowl to season the rice. Place the rice vinegar, salt, and sugar in a cup and put in microwave for 15 seconds. We just want to dissolve the salt and sugar to make a solution. Now season the rice with vinegar solution. Allow the rice to cool to room temperature. Take a nori sheet. Place it on the mat, with the shiny side facing down. 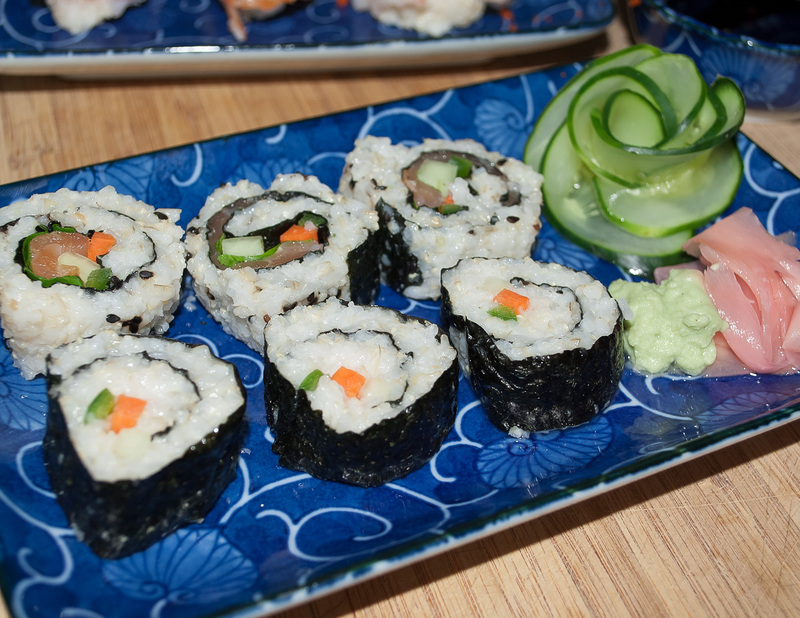 Grab a handful of prepared sushi rice, and spread it gently over the nori – about 1cm high. There’s no need to press the rice onto the nori, only spread it. Line up the cucumber, carrot, jalepeño on the roll. Spread a bit of the chipotle mayo on the vegetables. Cut into 8 equal pieces. For best results first cut in half, then cut each half into two, and then again. Wrap your bamboo mat with plastic wrap. This is necessary in order to prevent rice from sticking to the mat. Take a nori sheet, and break it in half. Place one half on the mat, with the shiny side facing down. Sprinkle a spoonful of black and white sesame seeds evenly over the rice. Line up the green onion, smoked salmon, avocado, cilantro and some cream cheese on the roll. Watch my video debut with the Taste of The Times where I make Ensalada de Nopales, MexItaliano style! 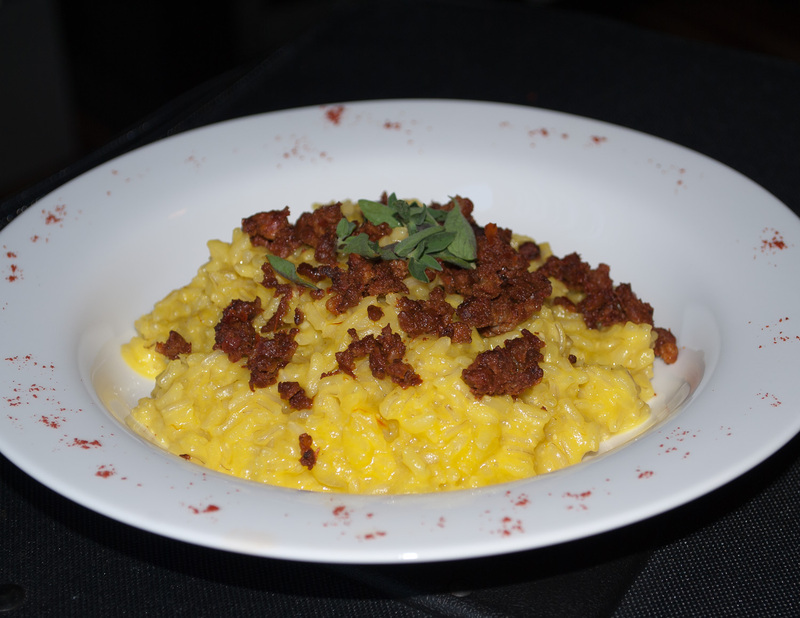 Look for another great video for Risotto Milanese Mexicana, next Wednesday at Taste of The Times! Clean the nopal to remove all the needles and nubs on each paddle. Julienne each nopal into small strips about 2 inches long. Rinse and then blanch the nopales in boiling, lightly salted water for about 5 minutes. Rinse the nopal with cold water or shock on ice bath. Slice the onion, halve the cherry tomatoes, and chop the cilantro. Combine with the nopales in a mixing bowl. Stem, devein, and remove the seeds from the chiles and dice then add them to the bowl. Season with salt and pepper. Dress with the olive oil and vinegar and mix well. Wash and spin the arugula, then place on serving dish or bowl as a bed for the salad. Empty contents of mixing bowl on top of the arugula. Sprinkle with the crumbled cotija, top with the avocado slices and serve! Here we go with Round 2 of the Marx Foods Integrale Gauntlet! 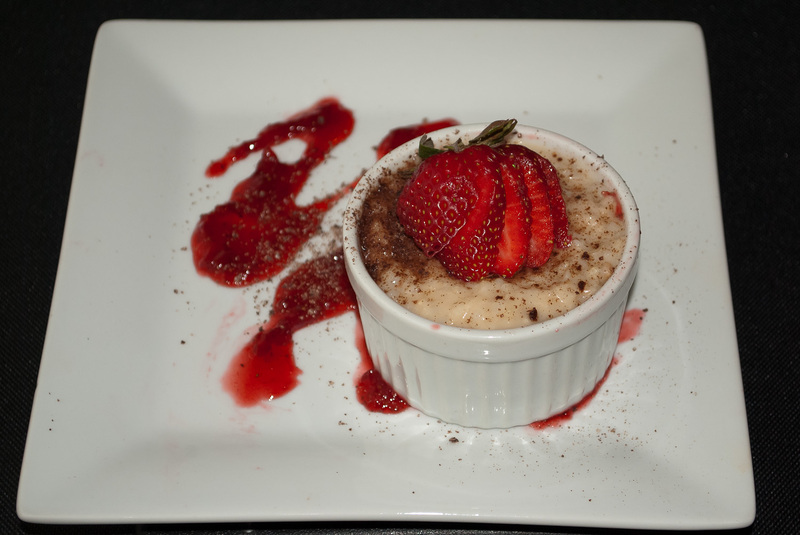 In this round, we were challenged in making a sweet dish with the same Integrale Rice supplied by Marx Foods. This dish was inspired by a friend, Heather Atwood, who once mentioned a Peanut Butter & Jelly Risotto , in jest, during a conversation on Twitter. Now, truth be told, this was pertaining to a savory risotto, which would have been a whole lot more challenging, but the inspiration is still legitimate. Once I heard this, I knew I had to make it! For this dish I simply wanted to create a peanut butter rice pudding and I wanted the jelly to be made from something fresh and in season. Strawberries are definitely in season here in New England so they seemed to be a perfect fit! To finish it off, I needed to find a way to add that simple Mexican twist that I love. So taking the basic building blocks of a peanut butter rice pudding, a fresh strawberry jelly, and the added twist of grated Mexican chocolate, I present to you The Peanut Butter and Jelly “Risotto”. I call this a “risotto” because I approached the preparation of the rice pudding in fairly the same manner as I would a risotto, except instead of adding broth, I added milk! You will notice that I use no custard in this recipe. This is because my daughter has a severe food allergy to eggs and she wanted to try this one! Do you think this is a one way ticket to the next round? Cook, stirring, until the mixture just begins to boil (being careful not to scald the milk). Reduce heat to medium-low and continue cooking, stirring frequently, until rice is almost tender and most of the milk is absorbed. This will take about 30 to 35 minutes. Meanwhile, mix the peanut butter, vanilla, and cinnamon together and then add to the rice mixture. Cook for another 5 minutes, then remove from heat and chill. 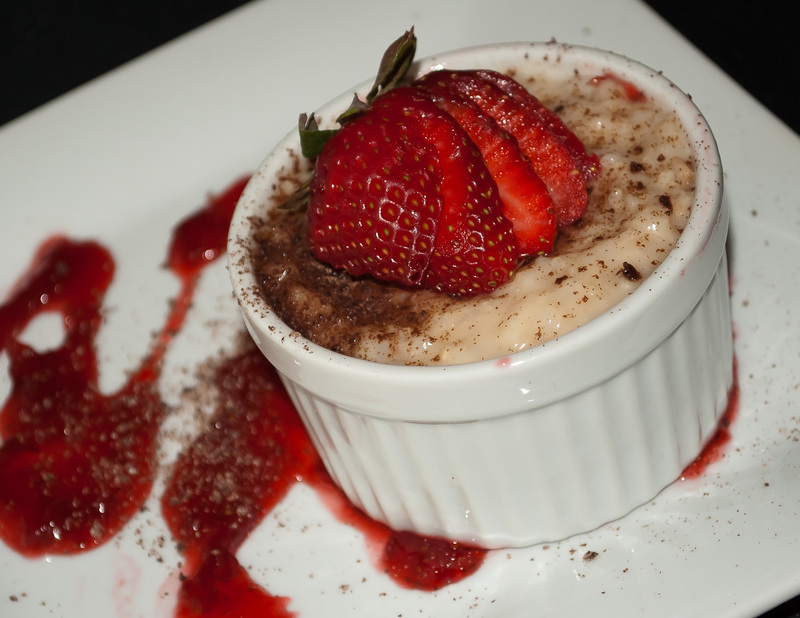 Serve in 6 ounce ramekins with the All-Natural Strawberry Jelly and dust with the grated Mexican chocolate! Chop the strawberries and heat in a medium saucepan on medium-high heat. Cook the strawberries down for about 5 minutes then macerate them to a pulp. Add the sugar and cook for another 5 minutes, stirring continuously. At this point the fruit should release its natural pectin, so remove from heat, cool, then preserve in your jars or containers. Can The DelGrosso Food Blog Win Another Title? You all remember the last post I made regarding my Integrale Milanese “Mexicana”? This is another fabulous entry into another fabulous contest. This time it’s the Marx Foods Integrale Gauntlet! I again, humbly call on all of my subscribers, followers, and casual readers to head on over to their site and please VOTE FOR MY ENTRY! Voting starts today 5/30 and ends on 6/1 so please HURRY! Because this is a fantastic risotto rice, that is how we’ll start this challenge. Create an irresistible, original risotto recipe featuring Integrale rice. You are welcome to use any additional ingredients you would like, but this risotto has to be savory. Links to the recipes from this first round will all be published on our blog and put to a public vote to narrow down the field. The top 10 bloggers will move forward. 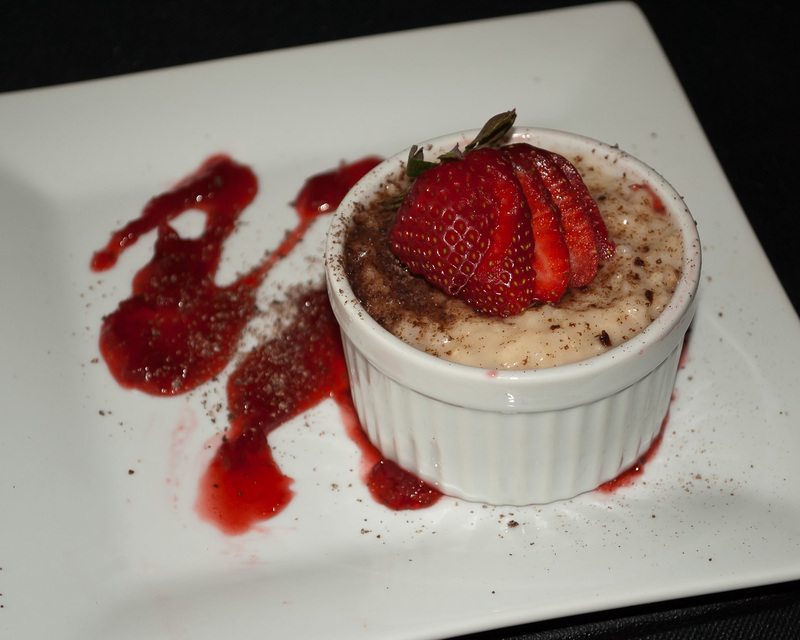 This is the sweet round – create an original rice pudding (or “dessert risotto”) recipe featuring the Integrale. Again, you can use any additional ingredients you’d like, so long as you make a sweet treat. These recipes will be voted on via an internal vote – each of the participating bloggers will vote for their top two favorite recipes (other than their own), and the Marx Foods staff will vote for their top 5 recipes (5 votes total). The 5 bloggers with the most votes from this round will move forward to the final round. The last hurrah! For the final phase, it’s all about presentation. This is the photo round! We want to be wowed to the point of drooling by the photo and the recipe. Create any original recipe of your choosing with the Integrale rice, just make sure it LOOKS as good as it tastes. The submissions will be judged by our photographer, photo assistant and videographer to select one winner. For those of you who read my blog, you know that one of my all-time favorite ingredients is saffron. This delicious, but expensive, spice has a unique one-two culinary punch. It has a wonderful hay-like, flowery-honey flavor when used correctly, and it brings a very unique yellow color to whatever it’s cooked with. I use it whenever I get the chance to use it in rice, chicken, or seafood dishes. Shortly after I won the 4thAnnual Marx Foods Morel Blogger Recipe Challenge, I jumped at the chance to enter another Marx Foods challenge, the Marx Foods Integrale Gauntlet. The Gauntlet is a 3 round challenge with the star being Integrale Rice! 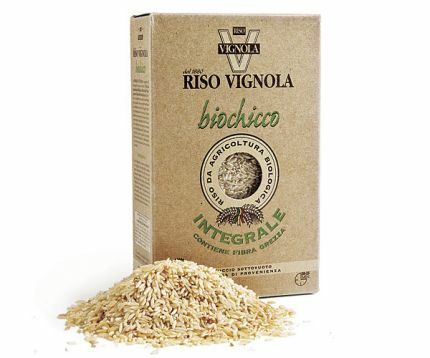 Integrale rice is an Italian brown rice that is really not a separate variety of risotto rice, but rather a way of processing the grain so that the rice maintains its raw fiber shell, vitamin B1, B5, B6, proteins and minerals. It is incredibly healthy and only grown and harvested by organic means. It has a slightly nutty taste and a firmer texture that enhances the “bite” of your risotto! Since this is a contest sponsored by Marx Foods, they kindly sent out 1 kilo of this amazing Integrale rice to use in my recipe! When I approached the planning of my dish for the contest, I knew that I wanted to use saffron, I really thought that it would complement the nutty flavor of the brown rice, but I wanted to add my own twist, using the Mexican flavors that I love as well. In my mind, I had visions of two different dishes, Risotto Milanese and Paella. Risotto Milanese being a classically rich risotto, made with bone marrow, Parmesan cheese, and of course saffron; and Paella Valencia, the mother of all rice dishes in Spain, made with Spanish Chorizo, seafood, chicken, roasted red peppers, paprika, and finally, of course, the saffron. 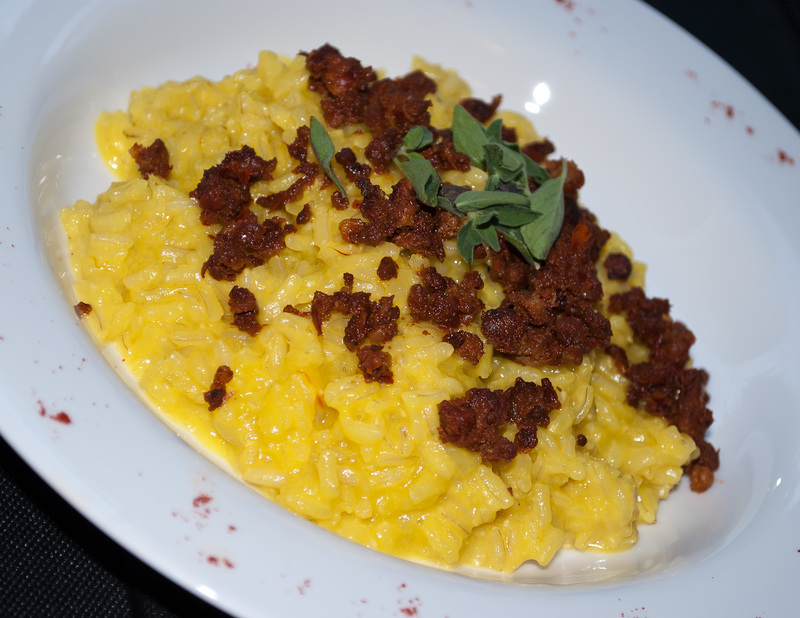 So, doing a bit of simulation in my head (as all engineers do from time to time), I would use the basic concept of Risotto Milanese and add tequila in place of the white wine, and mix in a bit of the essence of Paella Valencia, somewhat deconstructed, using fresh Mexican chorizo instead of the Spanish chorizo. So what place does Tequila have in a risotto you may ask? I believe that alcohol opens up the rice and prepares it to absorb the liquids introduced into the risotto. So why not use Tequila, and using Añejo Tequila would give the risotto another unique dimension of sweet, “oak-y-ness” flavor once the harsh alcohol cooks off. 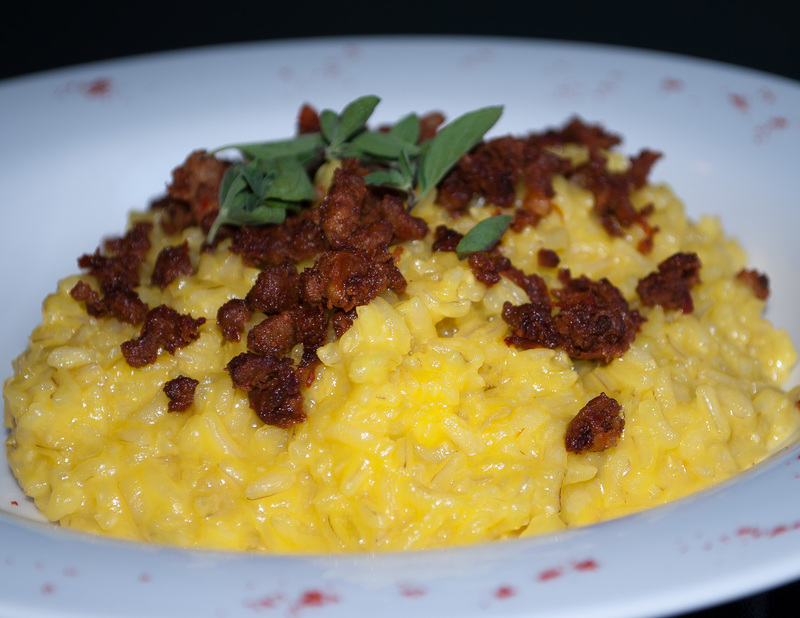 I would finish off the risotto with a mantecatura of butter and Manchego cheese. Manchego differs from Parmigiano-Reggiano in that it is made from sheep’s milk rather than cow’s milk. The cheese has a well developed, creamy flavor, with a distinctive, but not t0o overwhelming tangy aftertaste that is characteristic of sheep’s milk. It is the mother of all Spanish cheeses, it just sings “Marry me” to the saffron! So I set about making the chorizo fresh on Monday night. I have a standard recipe that I learned some time ago in Mexico. I also prepared my chicken stock on Monday as well. Having given some time for the chorizo to “cure” a few days to enhance its flavors, it was time to get dirty and get to the challenge! Risotto, once the technique is mastered, is a wonderful way to start a meal, or a stunning side to accompany any protein. Just a sidebar on Integrale rice. It is a slightly different beast, because of the raw grain shell. It takes a bit more stock and a bit more time to cook. I had to use about a cup more stock and I added about 10 minutes of cooking time to get it perfectly al dente. With some constant attention, a bit of pampering, and a shot or two of Don Julio, in about 30 minutes you have a deliciously rich risotto that will be sure to bless any table! Now I call on everyone to support us and go out and vote for this dish on May 30th! Place the 5 cups of broth in a saucepan and bring to a simmer. Add the saffron to the broth and keep very warm. Meanwhile, take the chorizo and heat over medium heat and cook for about 10 minutes, breaking it up with a wooden spoon as it cooks. Place 2 tablespoons of the olive oil in a large sauté pan over medium-high heat. Once it is hot, add the onion and garlic and cook until translucent, but not browning! Add the rice and stir with your Girariso to combine. Add the Tequila and cook until it is completely absorbed. When the rice is al dente, remove from heat and add the remaining 2 tablespoons of butter and the cheese and stir vigorously. Plate the risotto and sprinkle with the chorizo. Garnish with fresh parsley or fresh oregano. As I plan my Integrale recipe, I want to share with you a wonderful post by Cooking in Sens. I know there is no recipe here to enjoy, but I just appreciate the photography and the writing. I just had to share it! L’Ambiance des Halles is my fishmonger. 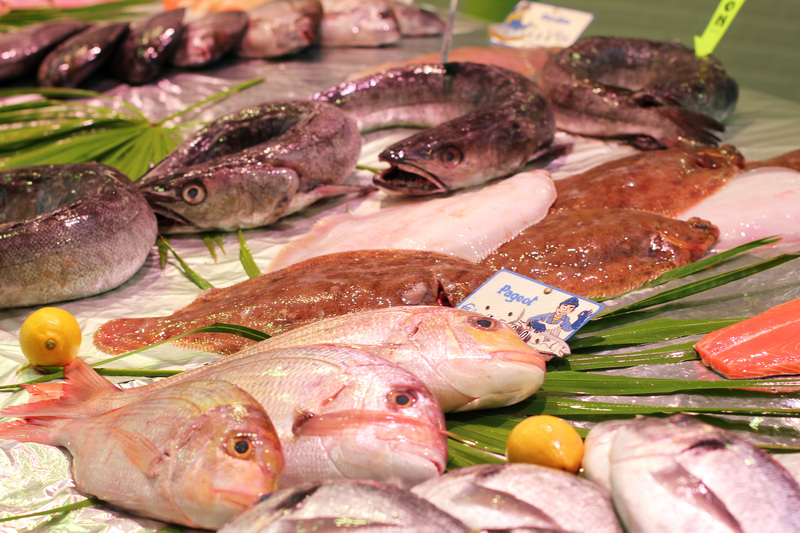 In addition to selling fresh fish and seafood, they have a shellfish bar, small restaurant and seafood platters for take away. Difficult to please when it comes to fish, I usually don’t bother with the prepared food on offer, preferring to handle the preparation myself, which is wise. 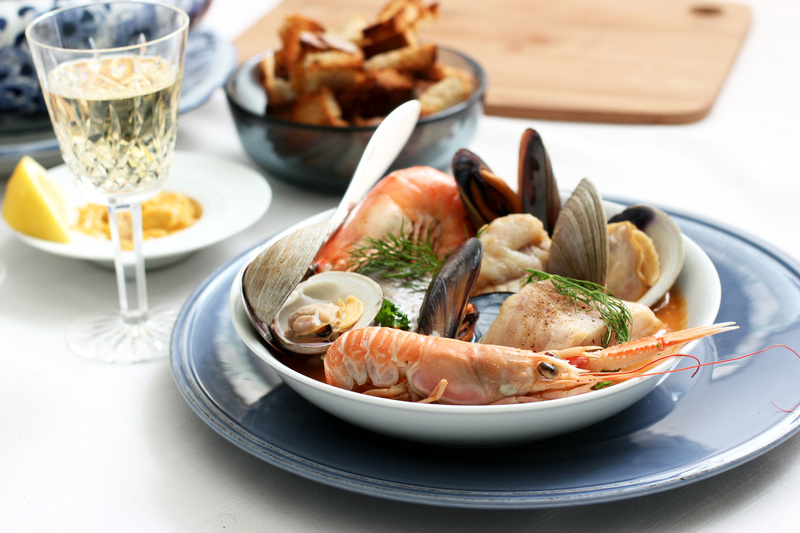 However today, in honor of the Ascension holiday, L’Ambiance was preparing Bouillabaisse for take away and I thought, what the heck, I’m bored with doing “freezer”, so I ordered two portions for Jade and myself, but the owner refused payment. So nice. I had fallen off the wagon anyway by buying and freezing two beautiful pork carbonades/grillades for a future barbecue. I’m not made of iron.